A simple webApp that allows anyone to inspect the Structure of a .gdoc file. Written and hosted as a Google Apps Script. Apps Script requires user authorization to access private data from built-in Google services or advanced Google services. When you access the app for the first time, you will see this image. Follow the instructions to authorize. After authorization, you will receive an email from Google. 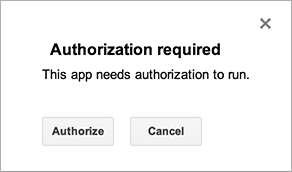 To be able to rund the web app you need to authorize yourself with you Google Account and grant permission for the app to access your .gdoc files. Since the app is hosted as a Apps Script web app, the usage is limited to quotas and limits for Google Apps script.